Oh my gosh, you guyyyyys. I loved this book! Lawrence (Lollie to his friends) Blakely is an attorney in Washington, DC. His bestie and law partner, Richie McKnight, wants to see a girl over the weekend, so he asks Lollie to travel to Pittsburgh in his stead and pick up some important documents for a case they're working on. The trip back turns into the Titanic of train travel--first, someone's sleeping in Lawrence's bunk, lower ten, so the porter makes him sleep in a different bunk. Then he wakes up to find he's been robbed of everything, including the important documents he was carrying. At this point Lawrence is pretty annoyed and yelling at everyone, but things only get worse when they discover the man taking up his bunk in lower ten has been murrrrrdered, and the conductor accuses Lawrence of the crime. AND THEN the train crashes, killing practically everyone. And that's just the beginning! Now Lawrence is being followed by the police, who think he's a murderer, as well as some unscrupulous people who think he still has the documents. Everything hinges on him finding out who killed the man in lower ten. I first heard about The Man in Lower Ten from Melody at Edwardian Promenade. The first chapter was little rocky for me, as Lawrence appeared to be yet another Edwardian bourgeois male hero. I don't have anything against bourgeois male heroes in theory, but come on. There's only so much a girl can take. But then one of the characters mentioned the Cubs, and how can you not like a book where the characters talk about the Cubbies? You can't. Not, that is. I'm glad I stuck with The Man in Lower Ten, because there's a lot to love in this novel, and it only gets better as you keep reading. First of all, I love the characters. Lawrence is clever, but not smooth at all, and Richie is the bestest. These are two people I'd love to hang out with. You know that thing where you start thinking about characters like they're actual people, to the point where you're worrying about them if they seem upset? YEAH. Was totally doing that here. The novel is also insanely twisty and fast-paced, with great, snappy dialog. Even if you're not a fan of mystery novels per se, I think if you enjoy olde timey movies such as Alfred Hitchcock's lighter suspense films, you'll enjoy this book. There are several elements in The Man in Lower Ten that are very common in Hitchcock films: for one, there's a MacGuffin, the documents Lollie picks up in Pittsburgh. There's also an amateur sleuth named Hotchkiss who just happens to be in the Pullman car when Lawrence is accused of murder, and applies the investigative techniques of Conan Doyle and Poe to real-life crimes (Lollie's reaction to this: "I nodded tolerantly. Most of us have hobbies"). And there's a "wrong man" element in the story, as Lollie is misidentified as the person who not only stole the documents, but killed the man in lower ten. There's also a romantic sub-plot with a beautiful woman whom apparently alllll the men in the mid-Atlantic states are in love with, and who is very definitely involved in the murder somehow. Just how far can she be trusted? I think I worried over this a lot more than Lawrence did. Of course, enjoying all of this requires a definite suspension of disbelief, and there are a few UnPC Moments (calling the porters "darkies," for instance); but despite being written over a hundred years ago, The Man in Lower Ten feels surprisingly modern, and is as much fun to read as any mystery novel I've ever come across. 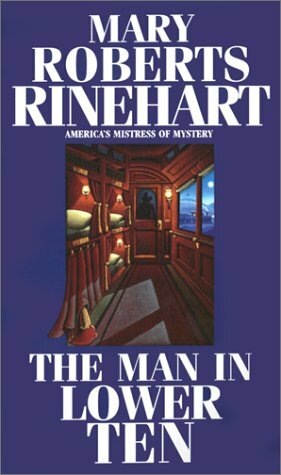 I now want to read ALL THE MARY ROBERTS RINEHART NOVELS. She's called the American Agatha Christie, but personally I think it'd be more accurate to call her the American Female Hitchcock. Definitely recommended!